These are the Angel Cards. I first experienced the Angel Cards in a yoga class a few years ago. The teacher passed out one to each student while we were in svasana. 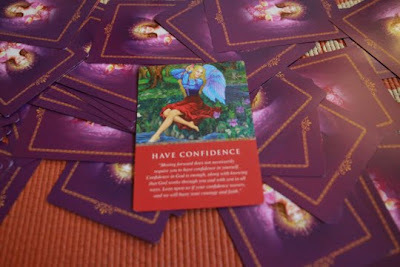 When we reawakened the card was there for us to take insight and inspiration from. Each card has it's "message" from the angels and then there's a little booklet with a deeper explanation and additional meanings. Pretty much, everytime I've drawn a card, it's been spot on. Today was no exception. I pulled the Have Confidence card. I've pulled this one several times in the last few weeks. When worry or concern was plaguing me. Today, I didn't even realize what the message was referring to until much later in the day. There's been some issues going on at work and the message from this card couldn't be more clear or related to those issues. 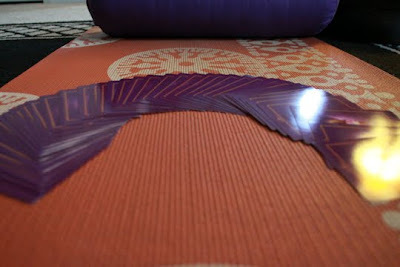 As I do 40 days of yoga asana, I'll pull a card each time I finish a home practice. To see what my message is for the day. Seriously, if you can check them out. Every person who has drawn a card from this deck, is like, whoa, how do they know?? ?